Windows Explorer provides the lens by which you see all the files and folders on your computer. To get the most out of Windows Explorer, you need to make Windows Vista show you the filename extensions for your files. The filename extension is the stuff that goes on the end of the filename, after the period. It tells you and Windows Vista which program(s) can read the file in a meaningful way. Although the extension is commonly three letters long, there are in fact no hard-and-fast length rules. If you let Explorer hide filename extensions, you vastly increase your chances of being zapped by a virus or a worm. Microsoft executives — people who should know better — have been bitten by Explorer’s intransigence. Don’t let it bite you. Every computer program since the dawn of time puts a handful of letters on the end of each file’s name to identify which program goes with the file. For example, Microsoft Word 2007 files are branded with .docx, WordPerfect files usually get .wpd, Adobe Acrobat uses .pdf, different image files get .jpg, .jpeg, .tiff, .bmp, and various other extensions, and Windows Remote Assistance uses (believe it or not) .msrcincident. Somebody sitting in a dark cave in Redmond decided that filename extensions were too confusing for the average user. As a result, Vista’s Explorer hides filename extensions from you. They’re still there, and they can definitely bite you in the posterior if you aren’t careful. Renaming files can be enormously complicated if you can’t see the extension (try renaming some.doc to some.txt and you’ll see what I mean). Most importantly, a very large percentage of the worms that come attached to e-mail messages take advantage of this blind spot to propagate. Say you get an e-mail attachment called FuzzyKitten.jpg. You haven’t had your daily dose of cuteness yet, so you download it to your computer. You double-click it to take a look, and do you get a sweetness overload? No. Because Vista didn’t show you the filename extension, you didn’t know that the full name of the file was FuzzyKitten.jpg.exe — an executable file. By opening the file, you execute some malware that e-mails itself to everyone in your address book and then turns your computer into an expensive paperweight. Do everyone a favor; take off the training wheels and make Vista show you filename extensions. That way you’ll never waste time second-guessing what a file’s really called or how to work extensions that need changing. Double-click any folder to open it, or choose Start→Computer. Press the Alt key to show you the toolbar. Then choose Tools→Folder Options→View. You see the Folder Options dialog box. Uncheck the Hide Extensions for Known File Types check box. Remarkably, unchecking this check box doesn’t just force Windows to show you filename extensions inside Explorer itself. The setting actually ripples all the way through Windows and every application. While you’re here, you can reveal other things that Vista has hidden from you. 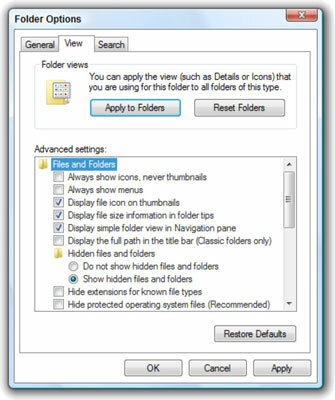 Select the Show Hidden Files and Folders option to gain access to all the files on your computer, even the ones that Microsoft doesn’t want you to fuss around with. Whose computer is it, anyway?